Fickle bloody country! This time last year we were in a drought situation here, 606.5mm at that point. This year we're at 945.5mm and it's friggin' 8 degrees outside and I've just lit the fire! Last year there was bugger all hay and silage because of the dry, this year it's too bloody cold and wet for the grass to grow! Oh, and last year a week ago I went to the Camperdown Cruise & Rockabilly Festival, I was in a t-shirt. This year was a friggin' leather jacket! Yep, we had a day and night of cool weather here last week. It was very odd. Back up to a more normal 30C today. We're still in the dry season, but just at the end. The wet season... well you never know what you are going to get. 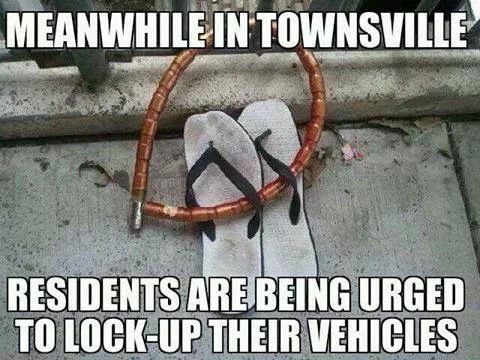 You guys in Mackay nicked all Townsville's rain last wet season. giruvian, gtadmin, Fatman and 4 others like this. It's very irritating in Melbourne because it has been basically winter since April. Can't stand Melbourne weather as it is always extremes. Extremely cold or extremely hot. Personally I like a nice 23 degrees, gentle breeze and some clouds (not overcast) Unfortunately my ideal day doesn't happen very often, we should be getting a few this time of year. That's my ideal day too Cams. If you can figure out where the weather is like that all year round, please tell! merexy and Cams like this.